Continuation from the previous 108 parts, the whole series can be found at http://www.nikoport.com/columnstore/. OR if the execution plan would be dimmed as TRIVIAL by the Query Optimiser, thus getting a single core execution and running really slow. One of the reasons behind this are the trivial execution plans, which are running Columnstore Index Scan in the Row Execution Mode – also known as a VerySlowExecutionMode for the big amounts of data. This post is about a major change to the Batch Execution Mode affecting Columnstore Indexes because in SQL Server 2017 there is an internal optimisation for the Query Optimiser, that shall apply FULL optimisation to the execution plans with the Columnstore Indexes, avoiding the pitfall of executing them in the Row Execution Mode, but let’s start a little bit from the beginning with examples of the problem. For that, I will once again use the free test database ContosoRetailDW on 2 different Virtual Machines with SQL Server 2016 & SQL Server 2017 RC1 respectively, setting the compatibility level to 130 on SQL Server 2016 and to 140 on SQL Server 2017 RC1. What happens exactly with the SQL Server 2016 that it has decided to use the slow execution plan? Let’s see the properties of the execution plan, where we can easily discover that in SQL Server 2016 we have a TRIVIAL execution plan, while in SQL Server 2017 RC1 the plan takes advantage of the FULL optimisation, thus getting the Batch Execution Mode and the faster execution speed consecutively. – altering the query by adding obvious and non-changing-result conditions that will force optimiser into more work (1 <> 0, PostiviceColumn > 0, etc) and into Full cost-based optimisations eventually. – using undocumented & unsupported Trace Flag 8757 that will skip the TRIVIAL optimisation and goes to full optimisation of our query. Notice that this change is connected to the Compatibility Level of the SQL Server 2017, which is 140, and setting the compatibility level to any other lower number will result in the previous functionality, which will execute the simple queries with a Trivial optimisation level – making Columnstore Indexes to run in the Row Execution Mode. Like with SQL Server 2016, some of the juiciest improvements in the query optimisation are connected to the compatibility level of SQL Server 2017. There is a new Extended Event in the SQL Server 2017, which is called compilation_stage_statistics and that contains some interesting information related to the TRIVIAL execution plan optimisation. Note: you will find it in the Debug channel, and so it won’t be searchable by default through the GUI, you will need to select this channel first. This event looks like a gold mine for those who are interested in diving into the Query Optimiser decisions … :) The most exciting property for the purpose of this blog post is “trivial_plan_scanning_cs_inde_discarded” that is described as “Number of trivial plans discarded or could have been discarded which scans columnstore index”. Very cool optimisation under the hood of the SQL Server which will go largely unnoticed by the most people, but which will do some very positive magic for those of us who care about the speed. I’ve noticed a number of optimizer timeouts with CCI queries – occurring as early as 10 ms and even under 1 mb of optimizer memory. 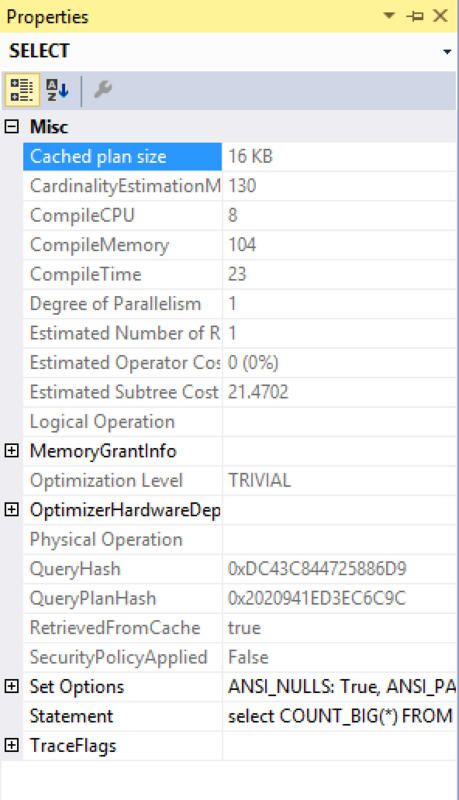 I’ll compare some of these queries in SQL Server 2016 & 2017… pulling through to full optimization for CCI queries *might* be enough to get them to further stages without timing out? I’m using queries involving tables with cluster columnstore indices and regular tables in SQL server 2016 ( version 13.0.4001.0). some queries take very long, 20 30 minutes, just to provide the estimate execution plan. And even so the same time or more to execute the query, which then it runs fast. Not sure of this behavior. Are there any workarounds? – is there some locking going on ? Do you have the details on it ? – are you using any trace flags ? – what are the query wait stats ? – what is the number of partitions in the table ? – what is the number of the Row Groups and the average number of rows per Row Group ? High Compilation times are not uncommon, but a lot of times there is an explanation for it.